NOTE: Hensel Phelps anticipates shutting down Old Ox Road (Rt. 606) (as described below) for a blast near the road. 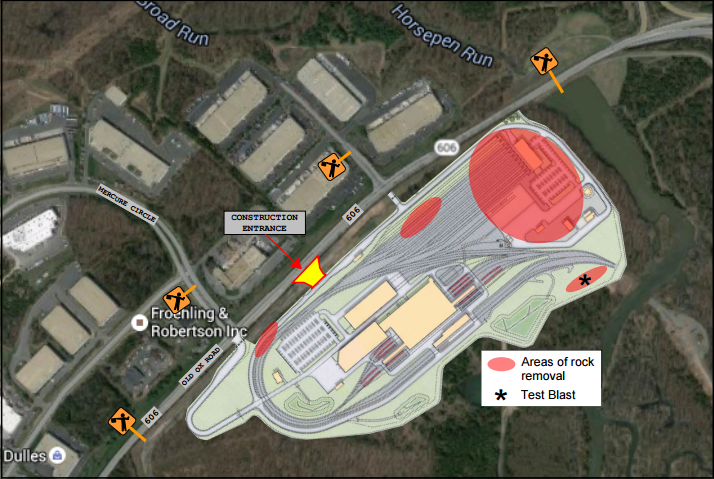 WHAT: Rock removal by blasting will be performed by Hensel Phelps to remove the diabase rock that has been encountered on the project site to allow work on the structures and rail yard facilities at the designed elevation. WHEN: The window for weekly blasting is Monday - Friday between the hours of 1:30 p.m. and 2:30 p.m. Blasting will not occur on Fridays if blasting is near Route 606/Old Ox Road requiring traffic stoppage. A 24/7 Hotline is available for Dulles Corridor Metrorail Project Phase 2, Package B construction-related issues: 952.939.6690. For general project information: www.dullesmetro.com or 703-572-0506.